As I mentioned last week, things have been a little hectic around here lately with the additional work I’m doing for my book. Luckily, my cookbook is for a very specific type of cooking, so while there are some recipes I come up with for the book that I really want to post on my blog too, there are a lot of recipes I come up with for the blog that wouldn’t be a good fit with the book. But even still, I spend a lot of time trying to think up new recipe ideas. This post was easy though, because it was your idea. Well, okay, maybe not you you. But I’ve had some readers tell me they were making my meatball recipes into burgers. And I’ve had a few others ask me if it was something I thought would work out. I guess I could have just added a line to my Lentil Mushroom Meatballs post saying, “Oh, and by the way, you can make these into burgers too!” But I’m greedy for easy recipe ideas right now, so Lentil Mushroom Burgers are getting a full post. I like texture in my veggie burgers, which makes forming patties (and getting them to stay together) a little bit tougher. It’s easy to get a burger to stick together when it’s made with pureed beans or veggies, but I don’t like the feeling of biting into those kinds of burgers–I want to see what’s in it, you know? (Yes, I am picky.) Baking is the best way I’ve found to cook the kinds of veggie burgers I like. There’s no flipping, no grates for the burger to fall through–it just works better. We topped our burgers with the usual burger things like lettuce and pickles, cashew mayo, and caramelized onions. While you’re not going to mistake the texture of these patties for a beef burger (which, in my opinion, is a good thing! ), the savory umami flavor from the mushrooms will definitely satisfy those of you who miss eating meat. I guess what I’m saying is that this isn’t a veggie burger that tastes like vegetables. Last month I posted a recipe for Cauliflower Hummus Burgers and this month I’m posting these Lentil Mushroom Burgers because I’ve decided to do a burger recipe every month this summer. Woo hoo! It’s the summer of burgers! It’s like the summer of love, minus the hippies, plus delicious veggie burgers. 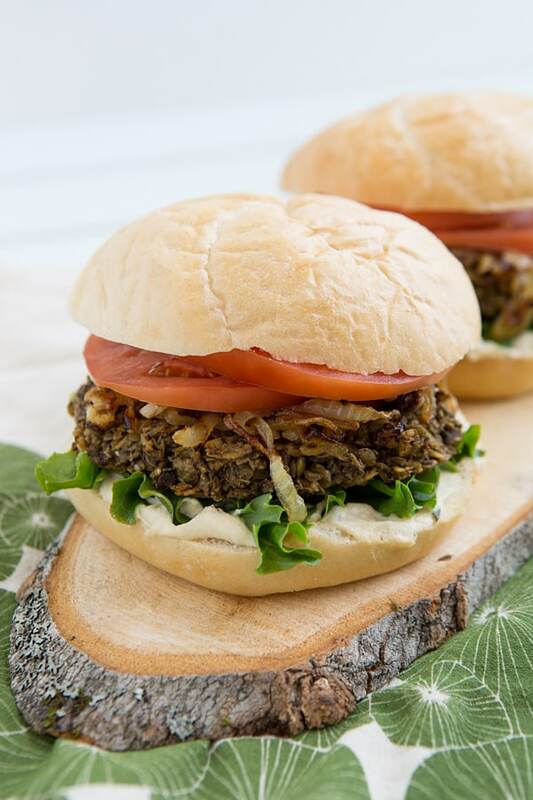 Savory veggie burger patties made with lentils, mushrooms, and oats. Combine lentils, bay leaf, and water in a small saucepan. Bring to a boil, then simmer over low heat for 10 minutes. (Yes, the lentils will be undercooked–don’t cook them for the time indicated on the package!) Remove from heat, drain, and cool slightly. Discard bay leaf. Add mushrooms and lentils to food processor. Pulse until coarsely chopped. Heat olive oil in a large skillet over medium-high heat. Add garlic and cook until fragrant (about 30 seconds), stirring constantly. Stir in mushroom-lentil mixture. Cook for about 4 minutes or until browned, stirring constantly. Add red wine to skillet and cook until evaporated. Stir in broth, soy sauce, oats, and Italian seasoning. Continue to cook, stirring constantly, until liquid has been absorbed. Remove from heat. Season with salt and pepper to taste and allow to cool slightly. Line a baking sheet with parchment paper (or spray it with oil or cooking spray). Divide the burger mixture into 4 patties and pat them into shape on the baking sheet. You want them to be pretty tightly packed because that will help them hold their shape. Bake them for 20-30 minutes, or until the patties are browned and cooked through. Use a spatula to carefully transfer patties to buns, then top them with all of your fabulous burger toppings. Those look AWESOME. 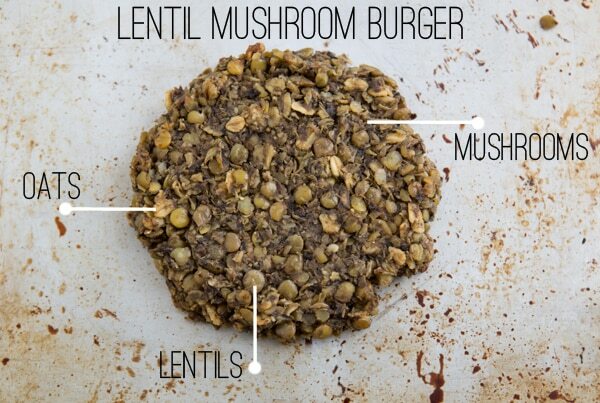 I love lentils and I bet they add a nice flavor to the burger. Yum! Oats too? How great! We have a ton of oats but can’t bring ourselves to make oatmeal in the summer. This seems like an awesome way to use them. I love those! I usually do them in pint madon jars and eat twice from each one. I use quick oats, about half and half honey and stevia to taste, salt, cinnamon, allspice, ginger, minced green apple, cranberries, chia seeds, flax meal, walnuts or pecans, plain Greek yogurt, and almond milk. Yum! My mom makes a mean lentil loaf, that we often turn into burgers or sandwiches the next day. Love all the mushrooms in this variation. Cashew mayo is my new favorite burger topping! Those look like some big, hearty veggie burgers! I agree, I don’t want my veggie burgers to resemble beef ones in any way (I had one of those last weekend at a party and could barely force myself to eat it). So one with lots of texture and visible ingredients like this is perfect for me! Last year we went to a restaurant and I ordered a veggie burger and it ended up being a Boca patty. I can’t stand to waste food, so I think I ate a few bites and let Chris finish the rest, but I still felt sick afterwards and kept having flashbacks about the taste/texture. I can’t stand the faux beef burgers! I just started eating veggie burgers…somehow they ‘chewed’ too much like meat for me. Now I have found that the homemade versions are really nice. I cannot wait to try this one at home. Yes, I know exactly what you mean! And I HATE those kinds of burgers. Blech! A great vegie burger is a big portobello mushroom instead of the burger and all the burger toppings in one of those half buns, you know? It was the best!!!! Wow! These look delicious! I bet the mushrooms make them nice and moist. I love mushroom. It would be amazing installing it into the burger. I have to try. Thanks for the recipe, Kiersten! Made these yesterday and popped them in the freezer for later use. Late night dinner tonight. Thought of these instead of fast food. Did my own version of caramelized onions, vegan mayo, sautéed tomatoes, and spinach. They were phenomenal!!! I’ve made these as meat balls with spaghetti squash and sauce. They were great that way. However, as burgers, they’re unbelievably good. No more commercially packaged veggie burgers for me. Way to go, Kiersten! I’m glad you enjoyed them! They really are great burgers to make in bulk and keep on hand. 🙂 Thank you for your comment! You’ll want to cook them, then freeze them. Yup, they are one of my favorite meals! Made these for dinner and they are delicious and easy!! Sometimes veggie burgers are tough because it’s so much chopping, prep, etc. But these are super easy and very little prep. Thanks for the great recipe. This is a great recipe. I didn’t have all of the seasonings, and improvising worked well. Made these tonight and my family loved them, thanks for the easy delicious recipe. These look awesome, I can’t eat oats though, so any sub ideas? Maybe quinoa flakes, i’ve heard they are like oats would that work do you think? Also would dried red lentils be ok? Sorry with all the questions but live in France and not always easy to find ingredients! Red lentils tend to fall apart a little more than green/brown lentils. I think I’d use Puy lentils (which I believe are French, so you should be able to find them!) before I’d use red lentils. As for the oats, I haven’t worked with quinoa flakes myself, so I’m not sure how they’d work out. Thanks for getting back to me so quickly. Yes I can definitely get puy lentils, so will try this ASAP and let you know how the quinoa flakes work out. These were so much better than I thought! I’m new to clean eating and these were simple and delicious! Thanks! No alcohol in my house. What’s the purpose of the wine in this recipe? Does it just add flavor or does it help tenderize? Could I leave it out or would you recommend something else in its place? The wine adds flavor to the recipe. You can make the burgers without it, but the flavor won’t be quite the same. I made there last night for my husband and i, and they came out great! I didn’t have stock so i just used water and sherry instead of red wine since i didnt have any red wine. My husband is a meat eater and even he loved them. Thanks for this great recipe! Wow, these are so delicious! I made them this evening and we both enjoyed them, even ‘must have meat’ boyfriend. Chopping the mushrooms so finely was a bit of a faff without a food processor and I used 1 tbsp of Worcester sauce in place of the soy, and good pinch of mixed herbs in place of the Italian seasoning. The burgers are amazingly filling. I thought we’d need two each, but struggled to eat more than half of the second. My coleslaw didn’t even get a look in! I’d love to make these for dinner tonight. We have a package of refrigerated, cooked Trader Joe’s lentils in our fridge right now. Would it work to use those for this recipe? Thanks! I’ve never bought those before, so I’m not sure how firm they are – I’ve found that fully cooked lentils usually result in a mushy burger, so I undercook mine slightly. These are so tasty! I made them for dinner tonight and they were even better than I imagined they would be. Plus they’re *so* easy to make, not nearly as labour intensive as so many other veggie burger recipes. I’ll definitely be returning to this one! Thank you thank you!